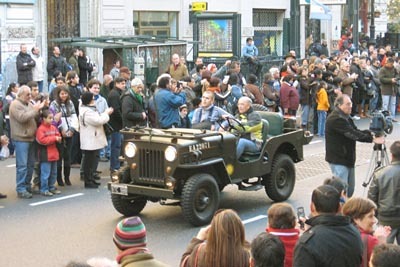 Jamie Gomis in Spain sent photos of his Jeep being used in the shooting of the 2009 film Iron Cross , which was the final film of the late actor Roy Scheider. A review in Variety said, " Iron Cross will be remembered as Roy Scheider's swan song and little else." But we'll remember it here as another high hood cameo in the movies. Here the camera crew does their best to secure the camera without scratching Jamie's hood. Also on CJ3B.info, see more CJ-3Bs in the Movies. 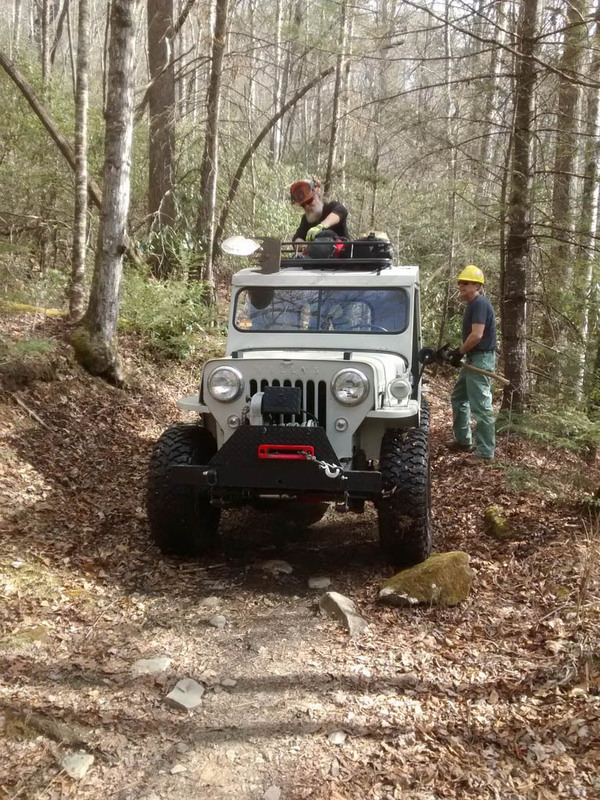 A trail maintenance crew in North Carolina finds Mark Dulken's 1963 CJ-3B is a great way to get to spots normally only accessible by foot or mountain bike. 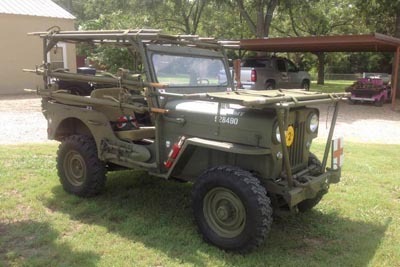 A roof rack on the Meyers aluminum halfcab makes a good place to stow some of their gear. 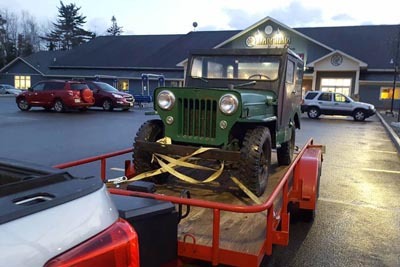 See Goose on the Loose for more photos of the '63. 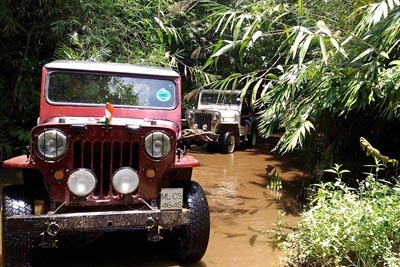 Shillong in the hill country of northeast India is sometimes called one of the most scenic areas of that country. 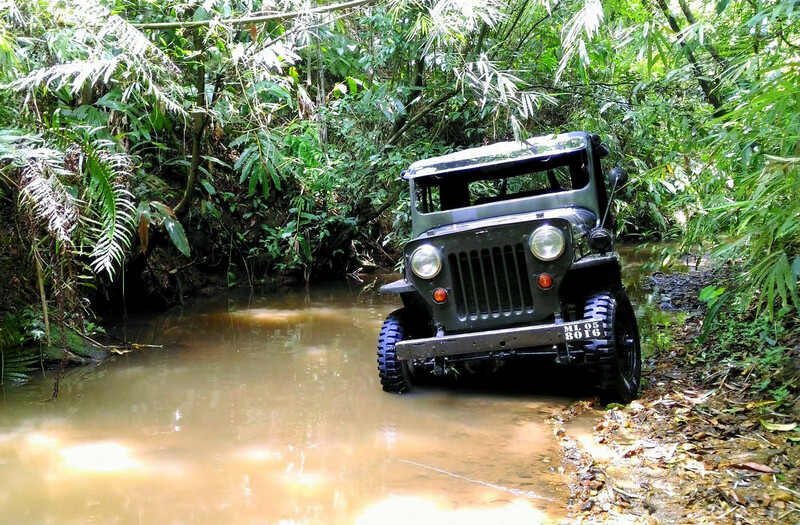 Phillip Ivor Marbaniang has been working hard on the restoration of a 1963 Willys CJ-3B, but isn't afraid to take it on the trails around Shillong. 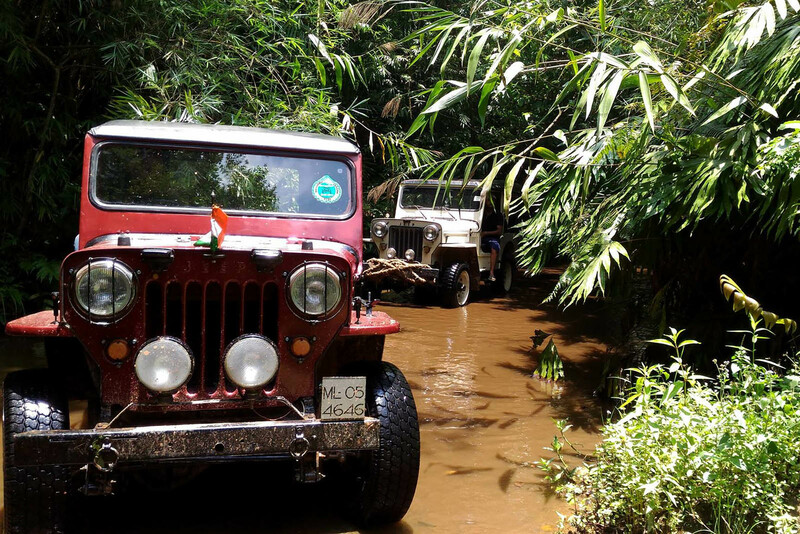 Some of Philip's friends on the same trail, driving Mahindra CJ-3Bs. 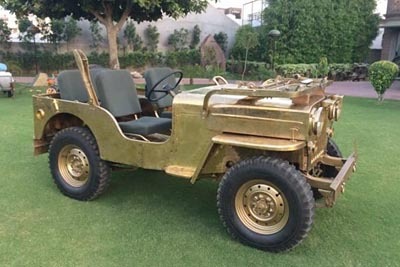 When Kaiser stopped putting "WILLYS" on the radiator guard in the early 1960s, Mahindra started stamping their built-in-India version with "JEEP" rather than leaving it blank. 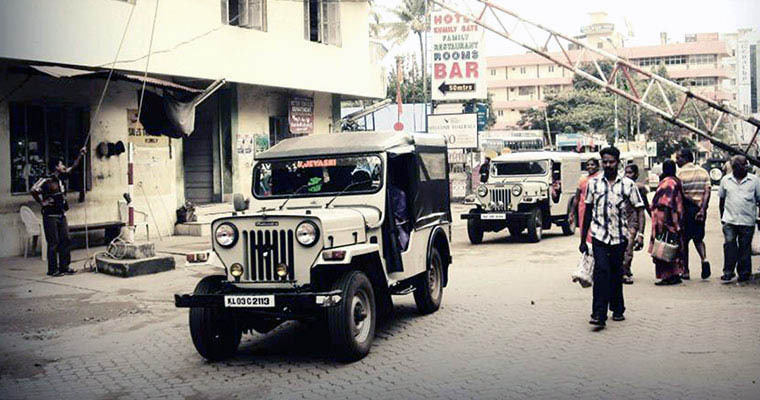 Another Mahindra classic is the long-wheelbase variation they called the CJ-4, often used as an ambulance with a steel hardtop. One place you might not expect to see one of these is the "Fins and Things" trail in Moab, Utah, but Jp magazine editor Rick Péwé tried out his former ambulance there, and says, "It's a great runner; I'd like to make it an overland vehicle but so much rust on the floor..."
While we're going vertical, here's a photo Michael Velez sent to the CJ3B.info Facebook page. "Love your website! 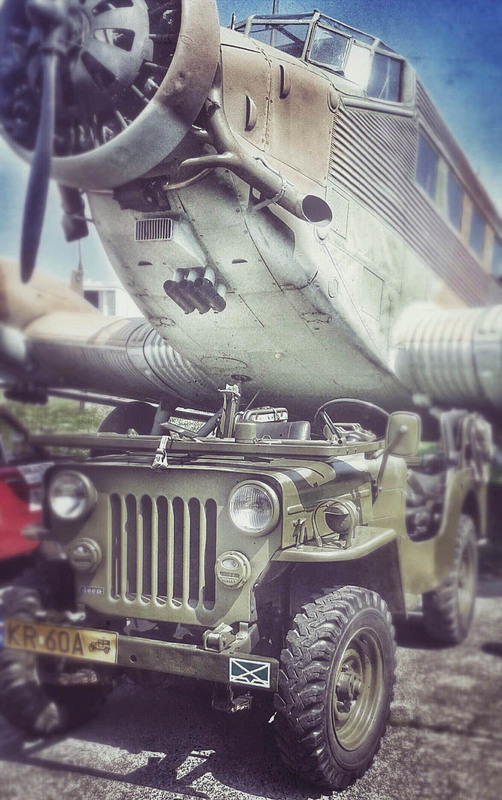 Here is my '54 CJ-3B. 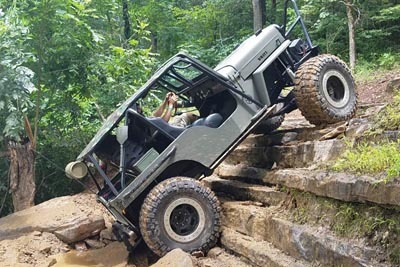 Stretched, narrowed Dana 60 rear, Dana 44 front. 229 3.8 V6 with SM420 trans and Dana 18 t-case. Sitting on 37-inch BFG Krawlers red label. 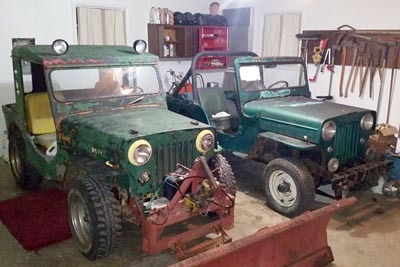 Been building for the past 2 years, but like all Jeeps they are never finished!" 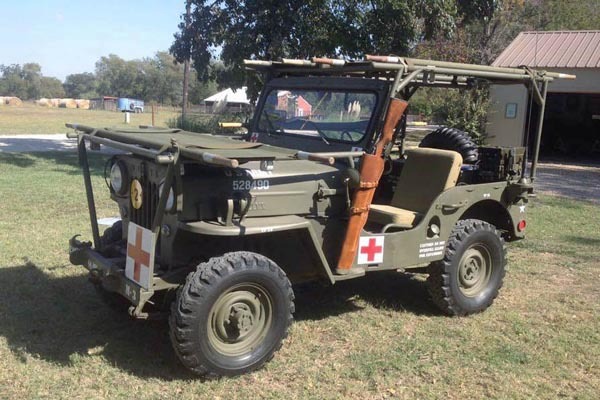 This '53 has a military Arctic hardtop, which requires a windshield modified to sit straight up and down. 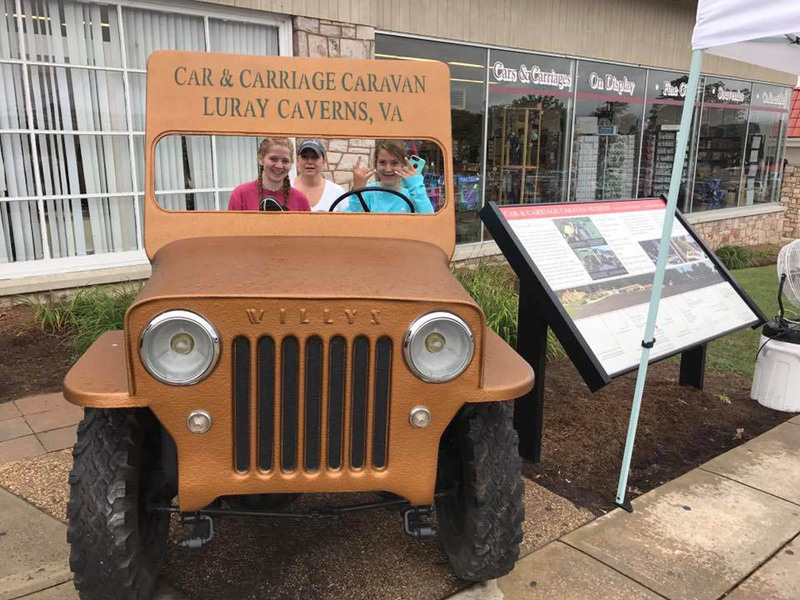 Ben Markle sent this photo from West Virginia, and said, "The Jeep was given to my dad by my great-uncle around 1978, because none of his own children had any interest in it. 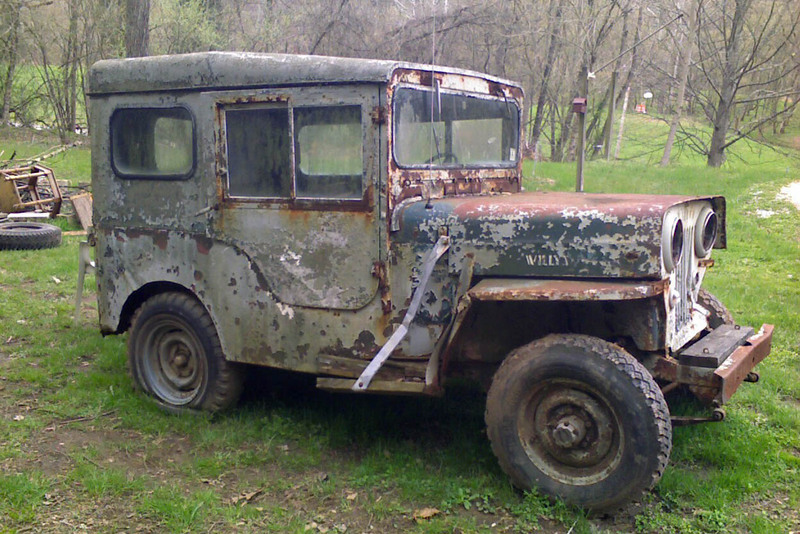 It had been sitting for several years, the engine was siezed up, and one of my cousins had shot out all the glass with his BB gun. 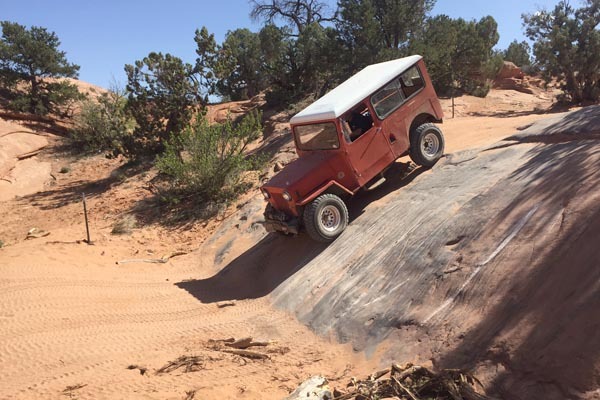 By the early 80's, my dad had rebuilt the engine and got the Jeep street-legal, and we used to use it for deer hunting when I was a teenager." Meanwhile, this '58 found a new home. Ryan Murdock bought it and took this nice photo before he even got it back to his place. Matthew Rushton has two high hoods in his garage in Indianapolis. 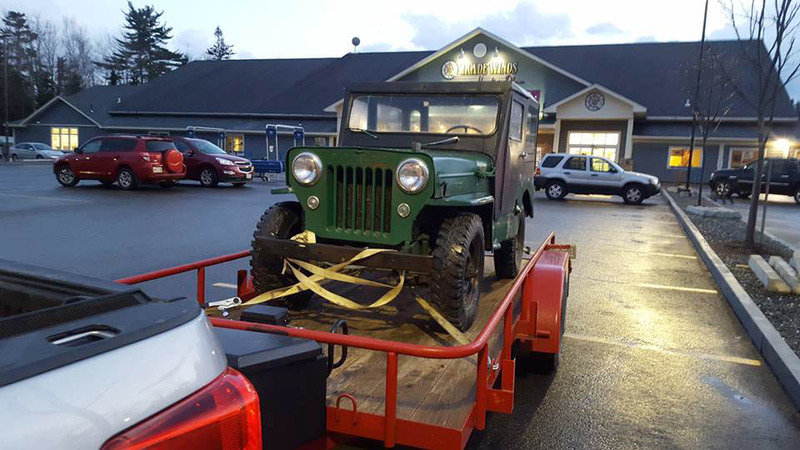 One is his late father's '53 plow Jeep, which is possibly going to be an axle and wheel donor for the '61 he bought off Craigslist in central Michigan in 2016. 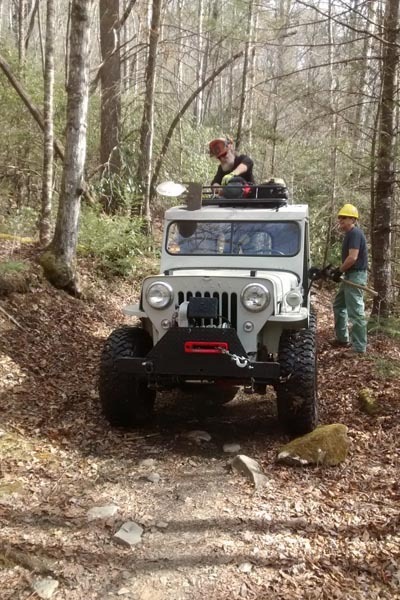 Great to see a young guy interested in getting a Willys back into shape. 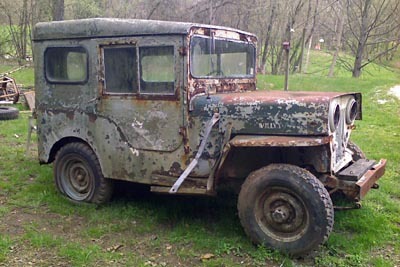 Here's another possible fate for a Jeep that's too far gone. Somebody did a pretty good job of removing the dents and sharp edges -- or maybe it's fiberglass? 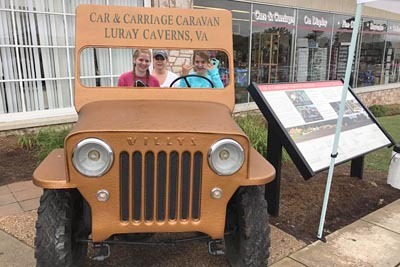 The eye-catching display is outside the antique car museum at Luray Caverns, a network of caves which is a major tourist attraction in Virginia. Thanks to Dale Petenbrink for the photo. 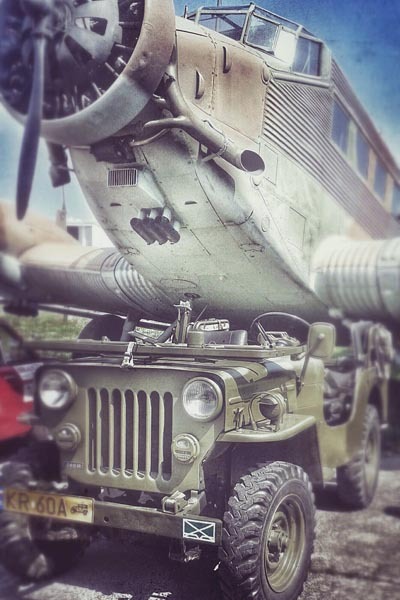 Maciej Zapiec in Poland took this photo of his VIASA military 3B from Spain, at the 2015 Małopolska Air Picnic. The annual air show is held at the Polish Aviation Museum in Cracow, which is also the oldest airfield in Poland. The plane is a German-built Junkers Ju 52/3m, used as a troop transport by the Luftwaffe in World War II, and by civilian air fleets around the world after the war. 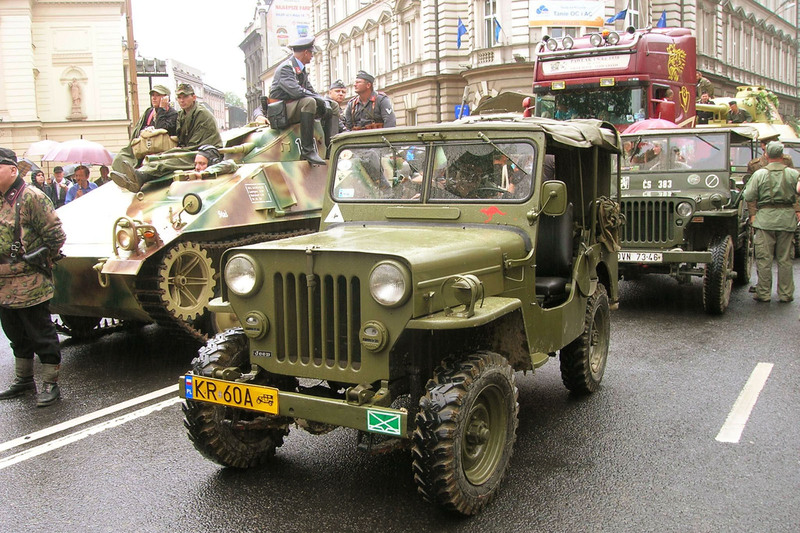 And he got this shot during a parade held as part of a Polish military vehicles event. 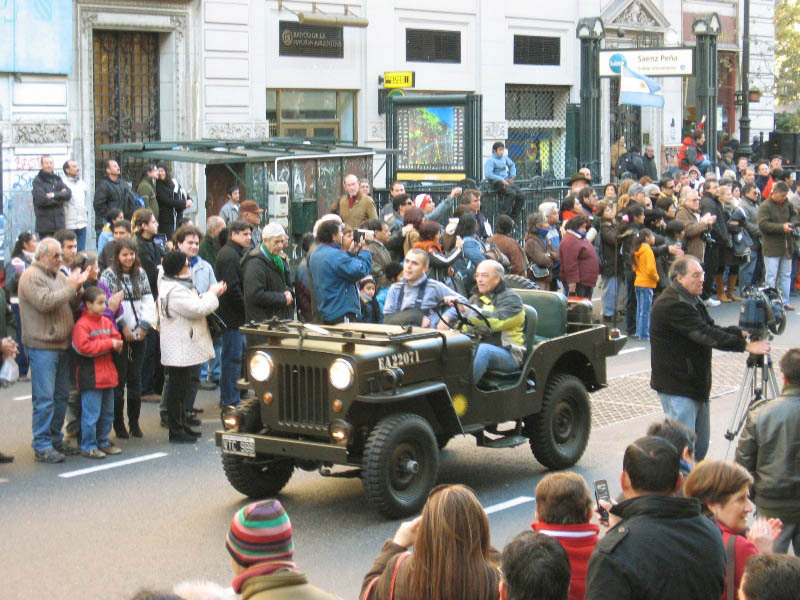 This parade is in Argentina, and the Jeep is a 1967 Kaiser M606 belonging to Ricardo Romano (see Ejercito Argentino 22071 on CJ3B.info). I woud like to hear the story of this one -- I ran across the pictures with no information. 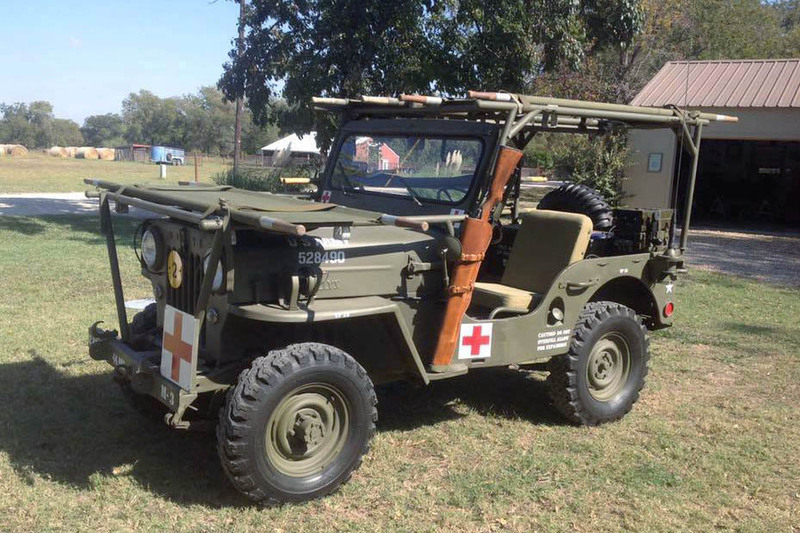 It's an imaginative restoration of a CJ-3B as a US Army field ambulance. Or here's another idea. 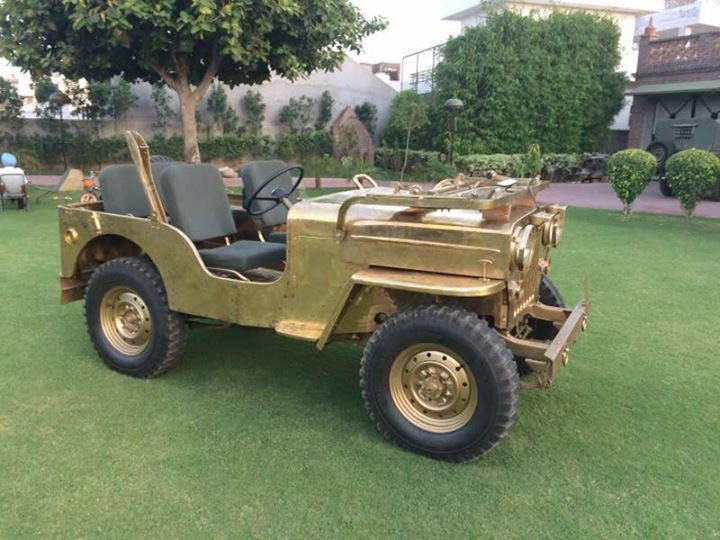 India has a long tradition of decorative and household items fabricated in brass, and somebody who didn't want to worry about rustproofing decided to do a Mahindra CJ Army Model in brass. Also from India: this photo illustrated a strange May 2017 news story from the state of Kerala, spotted by Jim Gregor. 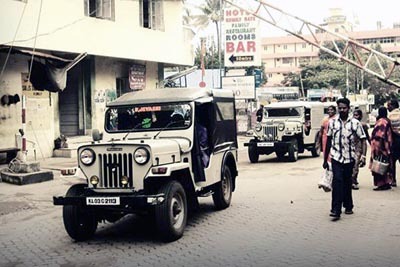 The government had decided to move liquor stores away from highways. 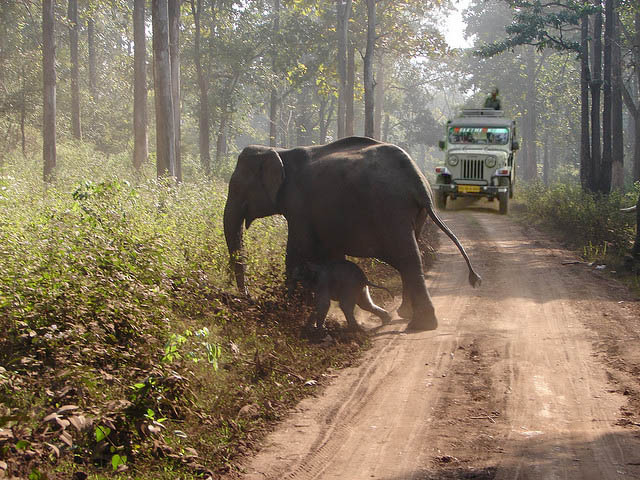 As a result, tipplers in the town of Mangra were facing a difficult walk uphill through the forest to the new liquor outlet. 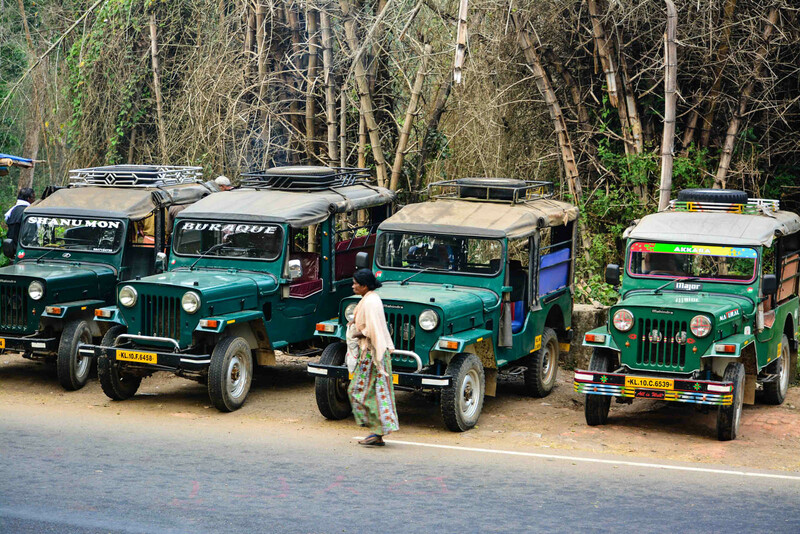 Jeep taxis were charging 10 Rupees per person for the short ride. 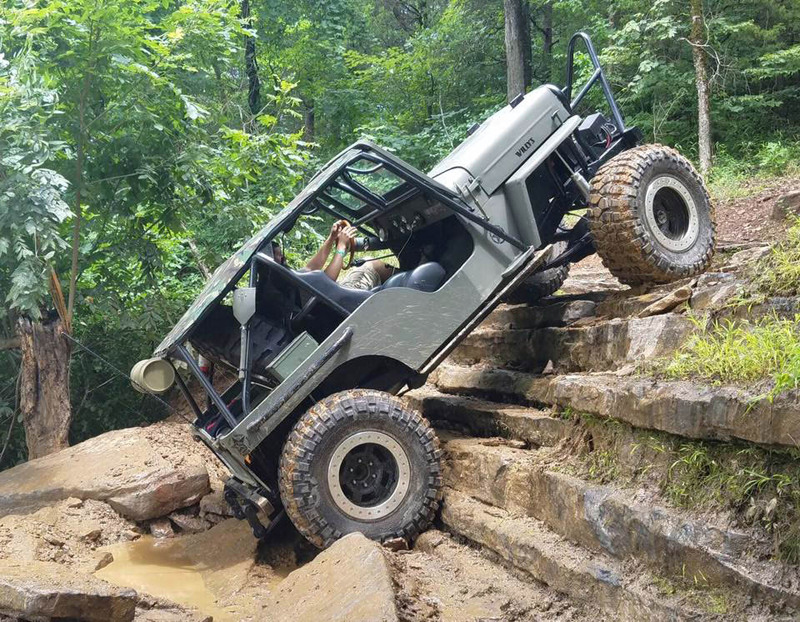 Some customers were trying to save money by walking up, but found they had to take a Jeep back because it was risky to climb down the tricky terrain with bottles! Last I heard there had been no resolution. And this nice-looking fleet of Mahindra taxis carries people on the Jeep Safari at Wayanad Wildlife Sanctuary, also in Kerala, India. Photo by Lakshmi Prabhu. 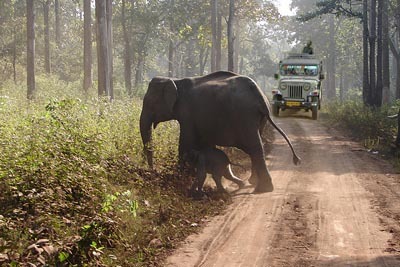 There are nearly 900 elephants, as well as tigers, deer and unusual birds at Wayanad, one of the largest wildlife sanctuaries in Kerala. Visitors must be accompanied by a guide. Composite image by CJ3B.info.